myExperience survey reports are produced for each survey. They are released to staff after all student assessment results are finalised and released to students. This is so that students are reassured that survey responses have no impact on assessment results. In order to protect the confidentiality of the students, if there were fewer than five students in a class (i.e. lecture, tutorial or web delivery), a report will not be generated. Access to view myExperience reports must comply with the clause 27 (d) & (e) in the UNSW (ACADEMIC STAFF) ENTERPRISE AGREEMENT 2015. Some academic staff have automatic viewing rights which are related to their position. EAs or professional staff can only have viewing rights if approved in writing by the relevant School/Faculty Viewer. Survey Administrators do not have report viewing rights unless approved by the relevant Head of School. All report viewers as nominated by their academic unit are then approved by the PVCE. The Team will then arrange PVCE approval. Sign in with your zID and zPass. Don't forget the ad in your login. You will be presented with your 'My Dashboard' homepage. The lower half of this page contains links to all of your course and teacher reports. You can search within this list for a particular course or semester by using the search function. Follow the links to view each report via HTML or PDF. For a WCAG compliant report please use the HTML version. Any greyed out links are for those classes (i.e. lecture, tutorial or web delivery) with fewer than five students. These reports cannot be viewed in order to protect the confidentiality of the students. This will create separate links for each report category - click on a link. This will open a new window with all reports contained in this category. Follow the links to view each report via HTML or PDF. The information below describes each section of the report and how to interpret these. The response data table details: the number of students who responded to the survey (responded); the number invited to respond to the survey (invited); and the ratio of responders over invited expressed as a percentage (response ratio). This section displays results for "Overall I was satisfied with the quality of the course" (or "Overall I was satisfied with the quality of this teacher's teaching") at course (or teacher), School and Faculty level. Mean and % agreement statistics are presented. These overall statistics are based solely on myExperience data - CATEI data has not been included. The School and Faculty level responses are provisional and may change once all survey results are finalised. % Agreement shows the total percentage of students who selected responses: moderately agree; agree; or strongly agree. This section displays a graph and statistics for each of the questions in the survey. The graph displays the percentage of students who selected each response on the six point scale from strongly disagree to strongly agree. [Total] shows the number of students who responded to the question. A response of 'N/A' is not counted towards the [Total] and teacher questions are not compulsory, so the [Total] value may vary from question to question. The myExperience process leads to course and teaching quality enhancement only if student perceptions of their learning experience prompt you into reflection, and then into action. 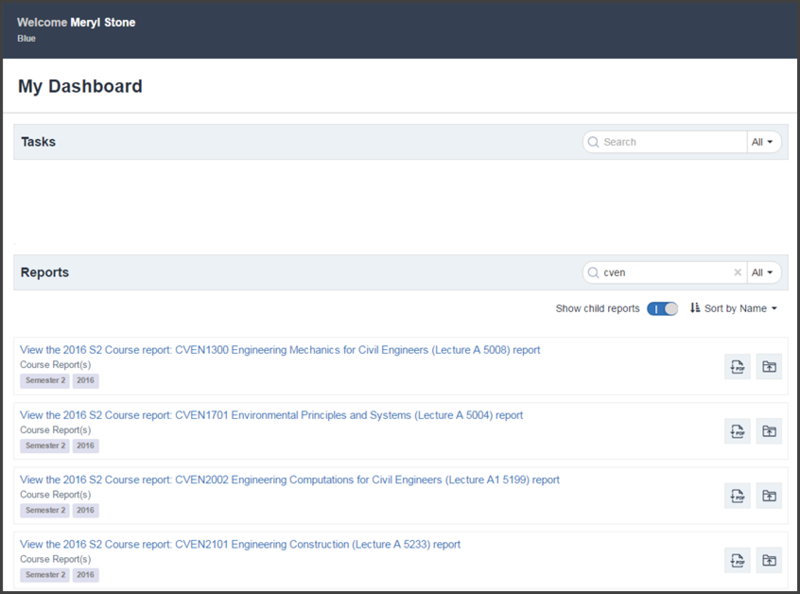 You can use the results of the student feedback in myExperience reports to enhance your courses and teaching practice. The Closing the Loop process details how you can use Moodle or other LMS pages to tell students about changes to courses as a result of myExperience feedback.